Studio Waterstone | Lori Plyler Art: sneak peek! When your house is for sale and Ms. Realtor calls saying she wants to show said house and said house is dirty, you drop everything and clean. Shoot. This results in lost studio time and a tutorial-less Tuesday. (Maybe I can get one in later in this week - fingers crossed) The good news? Today was much better and I finished four new handbags & totes! SO cute and heading to the shop tonight around eight-ish. ...assuming, of course, that Ms. Realtor does not call back. You're a time management hero. I'm usually just freak out and can't do anything in these situations. 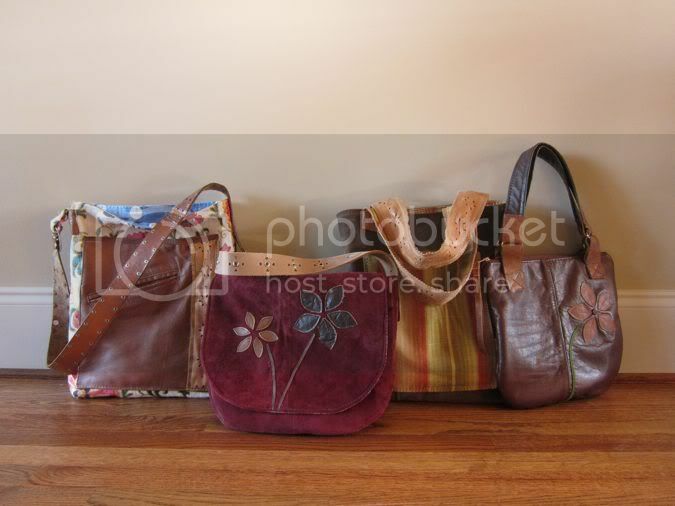 Loving the new bags especially the far left one with the floral pattern (and the light blue polka dot lining. cute!) The fabric and leather works so well together. If... this is Mr. Realtors last visit.. then that means the client likes it and want to make it their own... oh I shall hope! Waiting can be an anxiety.. It will be good to proceed forth!!! I hope everything goes quickly for you! Limbo is the worst!!!! Beautiful new bags!!! I bet this time was it!! I bet your studio smells all good and leathery. Thank you, thank you for saving that lovely red leather and not letting it remain the ugliest coat on the planet. Happy cleaning (up) for Ms. Realtor every time she calls. I am loving all your new bags and wish I could scoop up every one of them! Lisa and Debi - I wish it would go fast - but then I'd have to pack. AGGHHHHH!!! Princess - It smells rather nice and leathery, I must say. Kelley - I kick myself in the behind for not taking a picture of that leather coat! It was awful - vivid red (which makes a great handbag, but a COAT?) floral leather (which will be a blast to work with) and brocade. UGALEE is all I can say. Here is wishing you a less stressful week ahead! Thanks for giving us a peek! Great bags! I love the one on the far right with the flower!